Fine, gentle soap with ground coffee. An excellent product for soap in the kitchen, as coffee removes scents (fish, onion, etc.) from the hands. The ground coffee also peels the skin of the hands at the same time, so this wonderfully fragrant soap cleans your dirty hands very efficiently, but still without drying your hands! 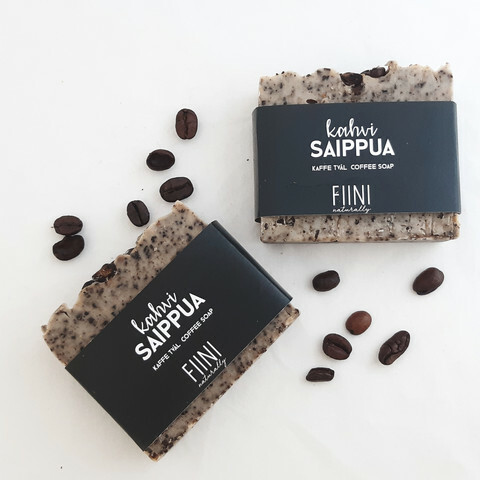 All Fiini Naturally´s soaps are made by hand in Ostrobothnia, a cold process. Soaps contain only natural natural ingredients. Soap does not contain any artificial dyes, perfumes or added chemicals. INCI: Sodium olivate (olive oil), aqua, * sodium cocoate (coconut oil), sodium rapeseedate (rapeseed oil), * sodium palmate (palm oil), cofea arabica (coffee), Solanum tuberosa Starch (potato flour). Note. The palm oil used in soaps is RSPO certified and organic certified, both of which guarantee palm oil is responsibly produced.